Last Friday, the imam of the Islamic Center of Davis, Ammar Shahin, delivered a khutbah (sermon) on the occasion of Israel installing metal detectors around the Al-Aqsa Mosque—which they did after three terrorists emerged from the Mosque and murdered two policemen, and then took refuge back in the Mosque courtyard before being shot by security forces. The Palestinians have reacted with fury, not to the original attack, but to Israel's attempt to secure the site in its aftermath. Several people have died in rioting and terror attacks over the last few days, including members of a family sitting down to Friday night dinner who were stabbed to death. Extremist imams in the West are encouraging that violence. 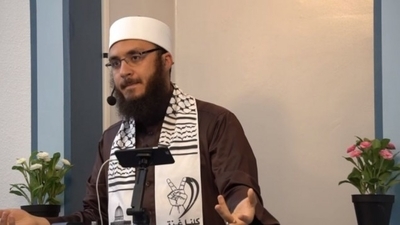 Imam Shahin is an Egyptian-born cleric who studied at Egypt's Al-Azhar University, and is currently pursuing a PhD in Islamic Studies from the Islamic University of Minnesota (IUM). IUM, which represents al-Azhar in the United States, is notable for being led by the extremist Walid Idris al-Meneesey—who frequently invokes anti-Semitic ahadith and who ruled in 2007 that Muslims were forbidden from participating with non-Islamic courts: "The authority to legislate belongs to Allah alone." IUM faculty have repeatedly refused to condemn ISIS or Hamas. The Islamic Center of Davis largely caters to students attending UC Davis, and hosts the Davis chapter of the Muslim Students Association. One hopes that these college students were expecting a calm, reasoned analysis of the situation from all sides of the question. Shahin quoted the infamous hadith in which Muhammad says that "Judgment Day will not come until the Muslims fight the Jews, and the Jews hide behind stones and trees, and the stones and the trees say: Oh Muslim, oh servant of Allah, [there is a Jew behind me, come and kill him!]." Shahin added, "They will not say: oh Egyptian, oh Palestinian, oh Jordanian, oh Syrian, oh Afghan, oh Pakistani. The Prophet Muhammad says that they time will come, the Last Hour will not take place until the Muslims fight the Jews. We don't say if it is in Palestine or another place." In other words, Shahin was calling for violence against all Jews, wherever they are, by all Muslims, wherever they are—including in the United States. He prefaced this discussion by saying, "Allah does not change the situation of people 'until they change their own situation.'" And he was even more overt in his closing prayer, in which he said in Arabic, "Oh Allah, destroy those who closed the Al-Aqsa Mosque. Oh Allah, show us the black day that You inflict upon them, and the wonders of Your ability. Oh Allah, count them one by one and annihilate them down to the very last one. Do not spare any of them.... Oh Allah, make this happen by our hands. Let us play a part in this. Oh Allah, let us support them in words and in deeds. Oh Allah, let us support them in words and in deeds. Oh Allah, let us support them in words and in deeds." Does the Islamic Center of Davis support such viciousness? If not, why did they proudly post the khutbah on their YouTube channel? And why have they not fired Shahin and replaced him with an imam who better embodies the spirit of the American Muslim community, instead of importing hatred from abroad?